Help your friends and family remember just how sweet life is by giving them unique candy gifts to celebrate your favorite milestones. Of course we all want plenty of candy on our birthdays! And especially for those hitting their later milestones, remembering the candy of your youth is a great way to celebrate how far you've come. Seeing a pack of your favorite childhood candies wrapped up for your birthday is a great way to feel young again, and if you're a gift-giver, taking the time to track down candy that was popular back in the day--candy that is filled with fond memories of lazy summers and happy play-dates--is much more meaningful than a simple pack of cheap chocolate from the grocery store. For someone hitting a milestone such as a 50th birthday, try tracking down a whole selection of favorite candies from the last five decades. You'll be helping your loved one celebrate a long, sweet life, and the promise of more to come! If someone you love has just graduated, gotten married, won an award, or moved to a new home, unique candy gifts will help to sweeten the moment. If you need special gift ideas, look at the year you met your loved one, when they were born, or their favorite candy growing up. It's a great way to celebrate not only their accomplishment, but how happy you've been to know them and watch them grow. For a wonderful housewarming present, see if their new address corresponds to a year, like 1986, and track down some fun candy from that year! Or build a gingerbread house and cover it with the new family's favorite treats. For a new graduate, remind them to stay sweet as they move forward in life with some favorite retro candies from their adorable toddler years. 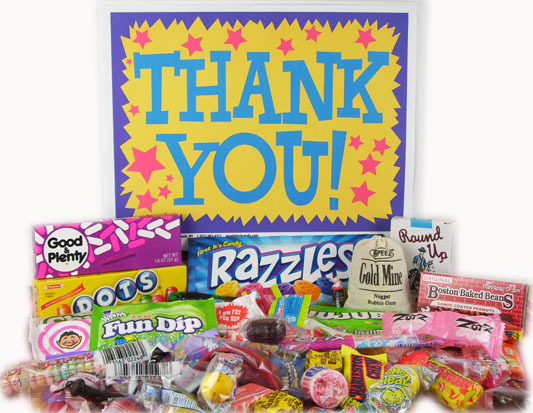 If someone you love is celebrating an anniversary, try giving a gift basket of candies that were popular during the year they met, and help to celebrate the many years of joy they've had since. Unique candy gifts aren't just a pack of candy: they're a celebration of a life well lived and a long, sweet friendship. Help your loved ones remember the best times of their lives with favorite treats, and celebrate the hope for many more years of love together! Getting Older? Have a Laugh! Help Make Turning Fifty Nifty!